On the road around 7.15am this morning! The wind was already blowing ... in fact it was blowing for most of the night. It is blowing from the north east and quickly turned to a northerly around 9am. Since we were going south to Warracknabeal we had a wonder tailwind and were able to sit on 22km per hour. It is a shame the road is a little lumpy and bumpy and very hard to see where the road has a dip until the last minute and then you have no other choice but to ride through it! 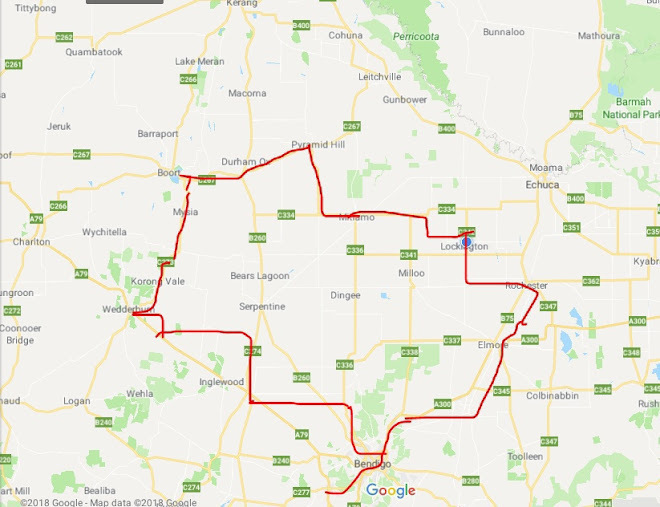 We got to Warracknabeal around 11.30 and picked up our dinner and continued on to Minyip which is south east of Warracknabeal. This is a very quiet road and only the odd truck every now and then. The wind is really blowing now and is a cross tail wind for us and it blowing us along. The wind is around 30km per hour and gusts are around 50km an hour ... I am thinking maybe we could make Stawell! 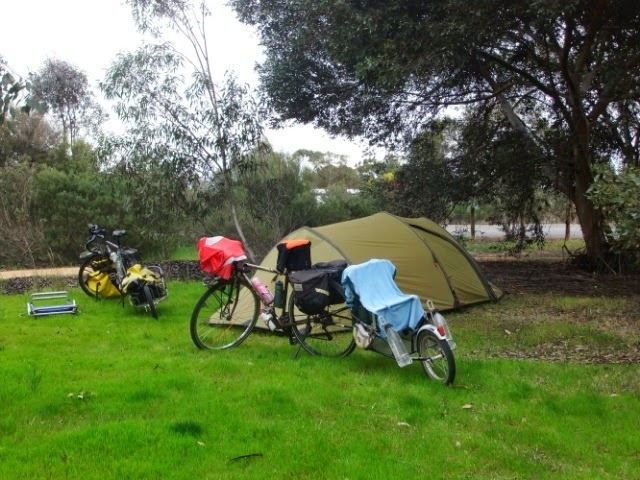 We had decided that we won't stay at Minyip and continue for another 20km to Rupanyup since we have such a good wind. 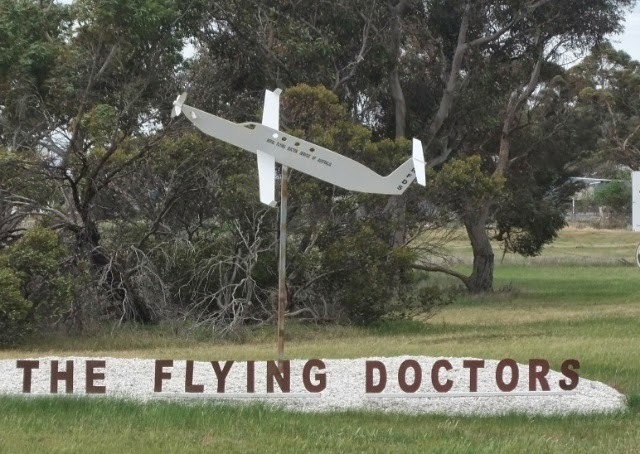 Minyip is where they filmed the Flying Doctors (I have mentioned that previously as we have been here before) in fact it is 'Coopers Crossing' in the show. and tomorrow we get even closer and will ride alongside of it after Stawell. We get to Rupanyup around 2.30 and have just completed our longest day of the tour so far - 113km and it doesn't feel like we have ridden that far since the wind helped us! and you know what it only took us around 5 and half hours! Gosh it took us that long to do the 50km days when we had headwinds going to Coober Pedy!!! this time the grass is really green! It is sheltered here from the wind and the rain that may come later tonight. We are hoping there is not much rain as there are good northerlies tomorrow (not as strong as today but good enought!) and we would like to move on. 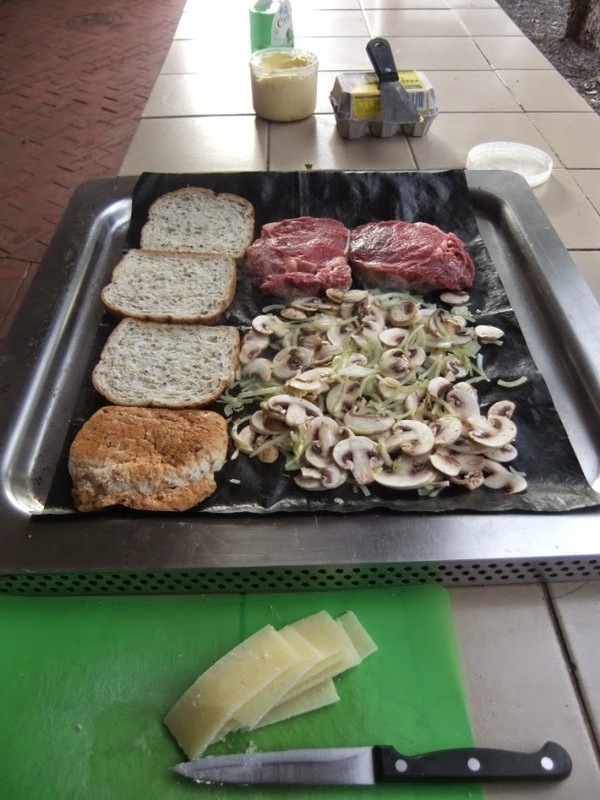 So dinner tonight is a real treat for us - Scotch Fillet (Economy cuts), mushrooms, onions, eggs and toast (done on the bbq) ... yummy! and on the chopping board is cheese which I picked up for $2 for a 250g block of live free cheese which is really low in fat (only 5.5% compared to normal cheese that is really low!) It is almost a white cheese and is quite sharp in its' taste but it is really nice. It is way off its' use by date but there were lots marked down ... I suspect people don't like its' pale colour and the fact that it is not creamy - a bit like parmesan cheese! Tomorrow who knows where we will be ... either Moyston or Willaura!